Weatherford International is a financially troubled company. Investors should expect huge swings in its stock price. Shares of Weatherford International plc (NYSE:WFT) are up 22.4% at 1:08 p.m. EST on Dec. 27, bucking the trend of big declines for many oil stocks on the day. At this writing, both Brent and West Texas intermediate crude oil futures are down more than 2%, only one day after Brent posted its biggest single-day gain in several years. So why is Weatherford's stock going up while most of the oil world is headed the other way today? In short, momentum and speculation. The company recently announced plans to issue $600 million in senior notes to "swap" for largely identical notes. Frankly, I can't figure out why the market finds this plan positive, as it doesn't fundamentally address Weatherford's structural problems with its balance sheet or recent inability to generate positive operating cash flows. 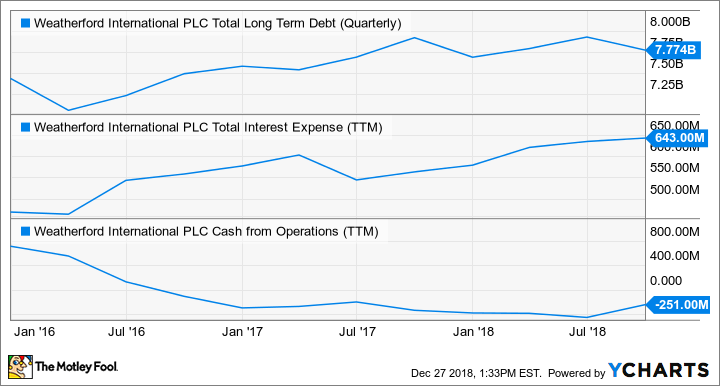 Over the past three years, the company's debt balance has trended upward, driving interest expense up sharply. At the same time, Weatherford's operations have struggled, failing to generate positive cash flows since mid-2016. WFT Total Long Term Debt (Quarterly) data by YCharts. Even after today's big jump, Weatherford's stock trades for less than $0.31 per share as the company deals with the weight of its massive -- and expensive -- debt obligations. Frankly, there's a very real risk that the company could default on its debt in the next few quarters, forcing management to consider bankruptcy proceedings. And if that happens, shareholders are last in line behind all the lenders, notes holders, and vendors Weatherford owes money to, meaning common investors could likely end up with essentially nothing. While it's not a given that Weatherford will go bankrupt, the reality is, this is a debt-laden company that hasn't generated positive cash flows from its business operations in essentially two years. Factor in the uncertainty in the oil markets -- crude is down more than 30% since October -- and the company could see even more operational challenges if its oil-producer customers start tightening up on spending. That's not the kind of environment Weatherford would likely be able to survive in its current condition. Add it all up, and investors should put Weatherford in the "gambling money" bucket. Things will have to go pretty much perfectly for the company to stave off financial disaster, and frankly, the oil market is currently about as uncertain as I've seen it in a few years. If you're looking for a more predictable, reliable way to profit from stocks right now, look elsewhere.